mountains on the north, and the Sacramento-San Joaquin River Delta (Delta) on the south. The Sacramento River Basin actually begins in Oregon, north of Goose Lake, a near-sink that intercepts the Pit River drainage at the California-Oregon border. Some key issues for this region are summarized here and discussed further later in this report. Agriculture. Between 2005 and 2010, the region supported about 1.95 million acres of irrigated agriculture on average. Approximately 1.58 million acres is irrigated on the valley floor. The surrounding mountain valleys add about 370,000 irrigated acres to the region’s total — primarily as pasture and alfalfa. The gross value of agricultural production in the Sacramento Valley for 2011 was about $4.1 billion (California Department of Food and Agriculture 2013). Rice and walnuts are the highest grossing crops in the region followed by almonds and tomatoes. The direct, indirect, and induced effects of the agricultural industry to the regional economy are discussed in this report. ranged from zero to 10 feet. Flood. Exposure to a 500-year flood event in the region threatens approximately one in three residents, almost $65 billion in assets (crops, buildings, and public infrastructure), 1.2 million acres of agricultural land, and over 340 sensitive species. Almost 95 percent of Sutter County residents, more than 55 percent of Yuba County and Yolo County residents, and more than 50 percent of agricultural land region-wide are exposed to the 500-year flood event. Climate Change. Several different climate regions overlie portions of the Sacramento River Hydrologic Region. Air temperature data collected for the past century has been summarized by the Western Regional Climate Center (WRCC) for the different regions which are outlined below. Within the WRCC North Central climate region, mean temperatures have increased by about 0.8 to 1.7 °F (0.4 to 0.9 °C) in the past century, with minimum and maximum temperatures increasing by about 1.2 to 2.1 °F (0.7 to 1.2 °C) and 0.1 to 1.5 °F (0.1 to 0.8 °C), respectively. Within the WRCC North East climate region, mean temperatures have increased by about 0.8 to 2.0 °F (0.5 to 1.1 °C) in the past century, with minimum and maximum temperatures increasing by about 0.9 to 2.2 °F (0.5 to 1.2 °C) and by 0.5 to 2.1 °F (0.3 to 1.2 °C), respectively. Within the WRCC Sierra climate region, mean temperatures have increased by about 0.8 to 2.0 °F (0.5 to 1.1 °C) in the past century, with minimum and maximum temperatures increasing and decreasing by about 1.7 to 2.8 °F (0.9 to 1.5 °C) and by -0.2 to 1.3 °F (-0.1 to 0.7 °C), respectively. Nevada decreased by about 10 percent, which equates to a loss of 1.5 maf of snowpack storage (California Department of Water Resources 2008). Projections and impacts based on modeling of climate change are included in this report. Some areas of the state with common water issues or interests cross the boundaries from one hydrologic region to another. 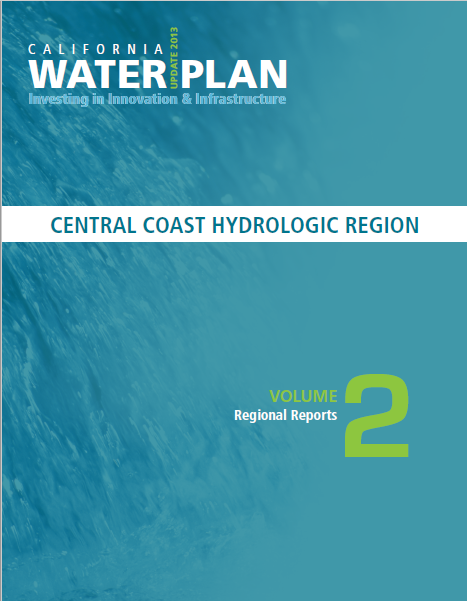 To acknowledge this, the California Department of Water Resources (DWR) developed the concept of “overlay areas” and first described overlay areas in California Water Plan Update 2005. 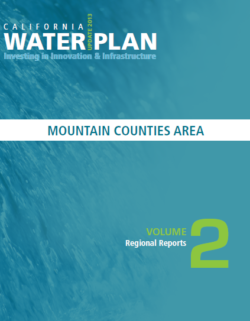 The purpose of the overlay areas is to collect and provide information that will better enable planners and decision-makers to address issues in areas of special interest where both of the following criteria apply: (1) the area is of statewide significance — meaning that water management strategies and actions taken in one area affect much of the remainder of the state — and (2) common water management conditions exist in the area — meaning that issues and integrated planning opportunities span more than one of the 10 hydrologic regions. The two overlay areas of special interest are the Sacramento-San Joaquin Delta (Delta) and Mountain Counties. For Update 2005, the Delta and Suisun Marsh were included as an overlay area because of its common characteristics, environmental significance, and the important role it has in the State’s water systems. The Delta and Suisun Marsh encompasses about 840,000 acres of tidal influenced land near the confluence of the Sacramento and San Joaquin rivers; and occupies portions of the Sacramento, San Joaquin, and San Francisco hydrologic regions. The geographic extent of the Delta overlay coincides with the statutory Delta boundary that defines the Legal Delta (California Water Code [CWC] Section 12220) and the Suisun Marsh as defined in California Public Resources Code Section 29101. The San Francisco Bay Hydrologic Region (Bay Region) has many significant water management challenges — sustaining water supply, water quality, and the ecosystems in and around San Francisco Bay; reducing flood damages; and adapting to impacts from climate change. In addition to these topics, a thorough discussion of climate change is presented including precipitation variability, reduced snowpack accumulation in the Sierra Nevada, and vulnerability of developed bay and coastal areas to sea level rise. With strong water planning and governance and several resource management strategies that can be applied, the region is poised to address these challenges effectively. The San Joaquin River Hydrologic Region remains one of the largest agricultural regions in California with irrigated acreage increasing slightly from 2005 to 2009, at the same time that overall water supplies declined. The 2007-2009 drought caused reduced surface water supplies, leading to increased groundwater pumping. Agricultural groundwater use increased from a little more than 1.6 million acre-feet (maf) in 2005 to more than 3.2 maf in 2009. Nonetheless, agricultural values increased from 2005 to 2008, declined somewhat in 2009, but bounced back in 2010. Furthermore, the urban population continues to grow, gaining 5 percent from 2005 to 2010. While agriculture is a stable economic sector, disadvantaged communities (DACs) still exist in the region, with four of the most populous cities in the region also qualifying as DACs: Stockton, Merced, Lodi, and Madera. To address the issues of lower water supplies and higher demands, as well as attempt to ameliorate water problems for DACs, local stakeholder groups are accelerating their use of resource management strategies via integrated regional water management group efforts.